Children's book publisher Make Believe Ideas is a company focused on producing exciting, interactive books to both inspire and encourage babies and children to learn and develop. We produce books suitable for all ages from birth to 10+ years, all unique in their design and illustrations. We are located in Berkhamsted, Hertfordshire and have been producing a wide range of high-quality children’s books since 2004. The talented and highly experienced team aim to publish 40-50 books every year. 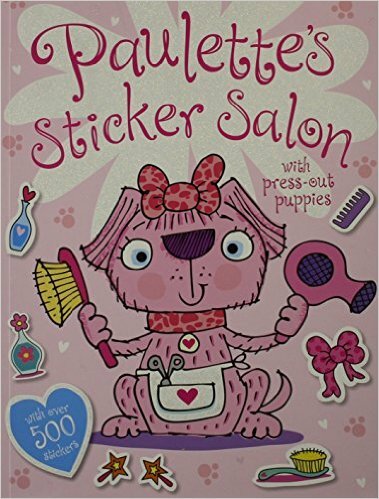 Paulette’s Sticker Salon, with sticker accessories and press-out puppies. Paulette the pink puppy is back, and she needs help in her salon! With over 500 stickers, children will love dressing and accessorizing Paulette and her friends in the various scenes. There are also two gatefolds of press-out dolls to be dressed up and played with! The book’s bright illustrations will delight little children and the brilliant stickers will keep them entertained and amused! A must-have for budding stylists! Paulette's Sticker Salon by Make Believe Ideas is incredibly fun! My daughter absolutely loves this book. There's over 500 stickers for kids to apply to various scenes throughout the book. Paulette's Sticker Salon by Make Believe Ideas also includes press-out dolls that can be dressed up and played with. Paulette's Sticker Salon by Make Believe Ideas has been keeping my daughter entertained for hours. She absolutely loves Paulette the puppy and all her pink pals. Each page is filled with a fun scene for kids to decorate with the stickers. Paulette's Sticker Salon by Make Believe Ideas is a wonderful book for kids! You can find Paulette's Sticker Salon by Make Believe Ideas on Amazon, Barnes and Noble and other bookstores.